These traditional Halloween recipes will help to brighten your family's celebration. 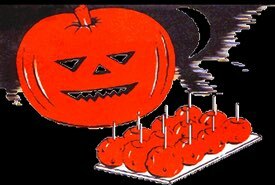 Below you'll find old fashioned recipes for Halloween candy, cakes, candy apples, scary treats, and more. 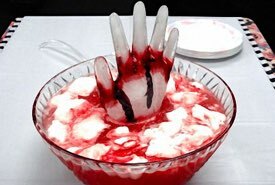 Make some delicious treats to serve at your next Halloween party. The Halloween treats below are delicious, affordable, and very easy to prepare. Plus, the vintage Halloween party ideas are a whole lot of fun. There's nothing like celebrating an old fashioned Halloween! The celebration of Halloween is thought to have originated from an ancient Celtic religious festival that signified the start of the darker season of winter on November 1st, and the end of their calendar year. 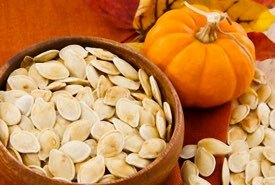 A new holiday was established by the Christian church in the 800s, and October 31st became celebrated as All Hallows or All Saints' Day, when the poor went from house to house begging treats called "soul cakes" made by the Christians. The word "Hallow" means "one who is holy." October 31, the evening before All Saints' Day, became known as All Hallows' Eve, or All Hallow e'en, resulting in today's Halloween. 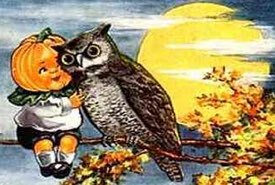 Early settlers to North America brought their popular beliefs and customs with them, and Halloween was considered a fun celebration for adults. It wasn't until the early 1900s that it became closer identified with children and treats. 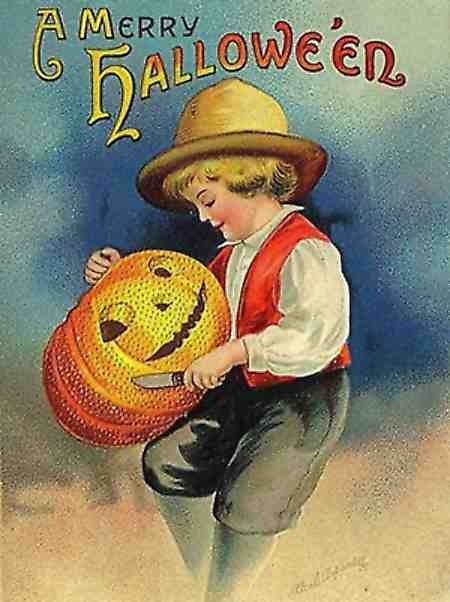 One of the earliest references to "trick-or-treat" appeared in a Canadian newspaper published in 1911. In the old photo above, my Grannie Bell (nee Gentles) can be seen in the second row, second from the left, a year before her marriage to my grandfather. 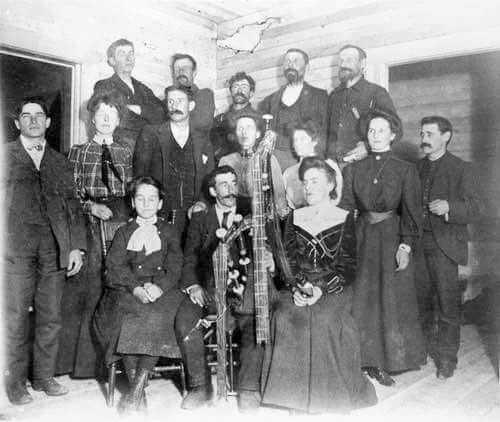 The 1905 Halloween party was typical of celebrations on the Alberta Prairie. Note the absence of costumes, though they did enjoy lively music thanks to two Scottish pipers and their bagpipes. The old Halloween traditions formed the basis for our modern celebrations, and the traditional Halloween recipes, costume disguises, candlelit jack-o'-lanterns, candy treats, apples, and silly acts of mischief gradually became part of the fun. Through the years, some "tricks" were not so harmless, or fun. My father recalled outhouses being moved back a few feet so the unsuspecting householder would fall into the waiting pit. Imagine! Sometimes party guests went to return home and found their buggy hitched to the horse, the buggy on one side of the fence and the horse on the other. It was even said that one neighbor who wasn't well liked awoke the next morning surprised to find his hay wagon sitting fully assembled on the peak of his barn roof! In Canada and the United States, costumed kids carrying treat bags rush from house to house in the early evening shouting "trick or treat," while hoping the householders will be generous in offering candy and other goodies. If candy is not offered, some young people have been known to play "tricks" on the stingy householder, such as soaping their windows or winding toilette paper around their shrubs. Ringing the doorbell and then running away is also common. 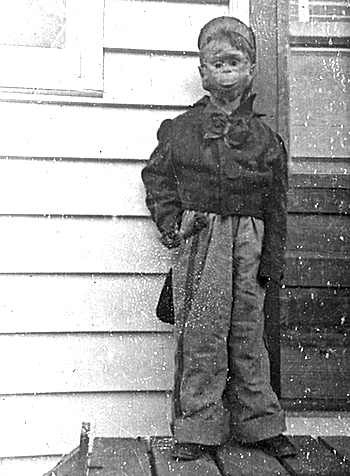 Yes, that's me pictured above in my homemade Halloween monkey costume. Handsome, eh? Mom sewed it up for me on her old Singer treadle sewing machine and back in 1955, I won the prize for best costume at Rifle Range School, the old one-room school I attended. Boy was I thrilled. Those school parties were so much fun. The biggest part of celebrating Halloween today is the candy treats. Much of the candy handed out nowadays is store-bought for safety's sake, but when I was a kid, it was mostly homemade. 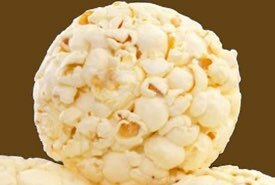 Taffy apples, popcorn balls, chocolate fudge, pull taffy, hard candies, apples, and peanuts were all enjoyed. Nothing beats an old fashioned Halloween! When it comes time for Halloween, it's easy to turn almost any dessert into a colorful and delicious Halloween treat. For example, the use of orange food coloring (or a combination of yellow and red) can add a festive color to many ordinary foods. 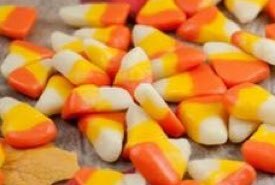 Also, there are any number of candies that can be used as dessert toppings and decorations for Halloween, such as traditional candy corn, orange and black jellybeans, and black licorice shapes. 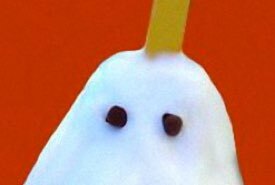 Learning how to make BOO-tiful Halloween treats is not difficult, especially with Grandma's traditional Halloween recipes below. You'll love the taste, and there are tons of old fashioned recipes to be found elsewhere on this website that you could adapt for Halloween. Just use your imagination. 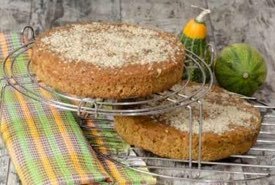 For instance, if you would like to serve something truly unique to adults, you won't find anything to compare with the historical Irish Barmbrack Recipe for making an authentic "soul cake" that's made to be eaten at Halloween. The traditional Halloween recipes and party ideas found on this page will help to get you started. Kids of all ages will enjoy making the homemade Halloween desserts and tasty party treats.